When choosing which time of the year to visit Corsica, why not consider Easter? It can be a wonderful time to visit thanks to the many celebrations happening around the island. It’s a opportunity to see a very authentic side of Corsica, which might be less obvious when the summer season is in full gear. Corsica is and has long been predominantly Catholic and remains very fond of its christian roots. Historically, Christmas is actually not the most important Christian celebration. For many Christians around the world, Easter remains the most significant time of the year because it celebrates the resurrection of Jesus Christ, which is at the core of their belief. So it is no surprise that Easter is a well celebrated time on the island. In most old towns, you will be able to follow traditional rituals. Two cities stand out for their particular traditions during this time of the year: Sartène, home to the famous Catenacciu procession on Good Friday, and Cargèse, where a part of the population descends from Greek colons, making it a city that celebrates Easter at the Catholic church on Sunday and the Orthodox one on Monday, following the byzantine ritual. Traditionally, during the holy week, church bells stop ringing. On the Thursday before Easter, churches take on a kind of mournful appearance: candles are put out, altars bared of any decoration, statues are covered in veils. Some towns already start religious processions with torches after nightfall on Wednesday and Thursday. On Thursday evening, many parishes commemorate the last meal of Jesus and his disciples, feet washing included. Good Friday is the most intense day of Easter celebrations. 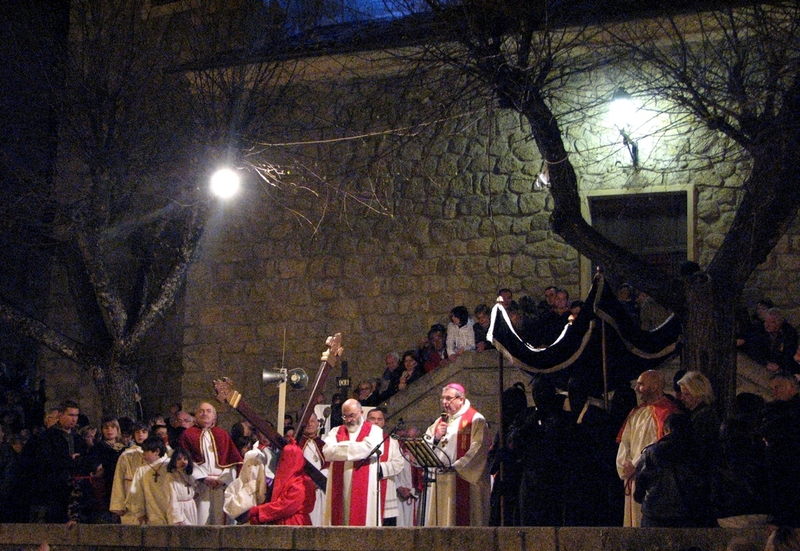 On Good Friday, processions replaying the dramatic Passion of Christ, almost like mini theater plays, take place all over the island. Each religious “confrérie” (brotherhood) organizes its own. Every town has its own traditions. In Corte, penitents carry the statue of Christ lying on stretchers. In Bonifacio, statues of saints are carried across town in a specific pattern. My grandmother was from Sartène, where the most famous Easter procession takes place: a red hooded and anonymous penitent (only the priest knows his identity and prepared him in secret for the big day) carries a heavy cross and falls three times on the way to the church. The crowd follows, chanting prayers and begging God for forgiveness. The ceremony ends in the church with more chants and prayers. The heavy and mystical atmosphere is undescribable. Even if you are not religious, you might be moved by the fervor of the crowd and the faith of the anonymous man who has chosen to do this hard penance. On Easter Saturday, there are many prayer evenings organized in churches. The priests often go and bless the houses, which have been thoroughly cleaned beforehand, and bless the holy water which will serve for the rest of the year. A big bonfire is often lit in the evening. On Easter Sunday, the atmosphere lightens up. Time to eat and party. The roasted roasted Easter lamb or baby goat is served for lunch. If you’re not a fan or if it just breaks your heart to eat a baby goat (I know it breaks mine), at least you’ll be able to eat dessert. The cacavellu or campanile is a traditional Easter cake: it contains an egg, still in its shell, which gets cooked with the cake in the oven. On Easter Monday, it’s time to go for a picnic with family and friends. 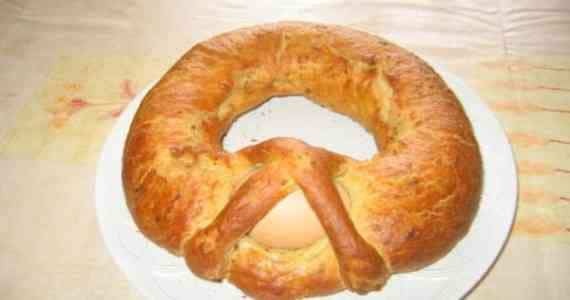 This is called “a Merendella”, which basically means picnic or small meal. I attended the procession the same day this photo was taken. Unfortunately, I can’t find my pictures, but I seem to have found one taken by somebody who must have been standing very close to me!